Beautiful Days Festival in Escot Park, Devon starts in two weeks so it was time to think about the Sunday theme. 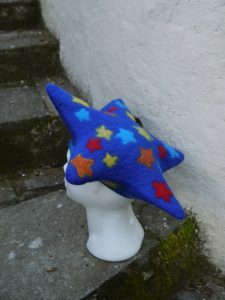 This year it is “stars” and I found a pattern for a star-shaped beret in Chad Alice Hogan’s book Fabulous Felt Hats. The prefelt hearts were cut freehand to give a more jumbled look. 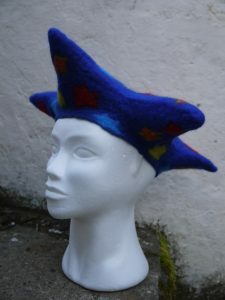 I used Corridale for the outer layer to help the hat hold it’s shape well. On the inside I used Merino to make it more comfortable to wear.